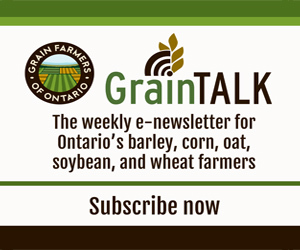 Grain Farmers of Ontario has joined other farm organizations and agricultural industry members in support of an initiative called ‘Bees Matter’. The goal of the Bees Matter initiative is to provide a science-based counter plan to the Government of Ontario’s regulatory proposal concerning neonicotinoid-treated seed, while at the same time, educating the Ontario public on honey bee health facts that have been omitted in media and government communications. Full page ads with an “Open Letter to Ontarian’s” were run at the end of January and in February. The ads were part of a larger national initiative through Bees Matter which is creating awareness of the scientific facts surrounding honey bee health in Canada with representation from farm organizations and agricultural industry associations from across the country. You can see the letter at www.beesmatter.ca. The goal of the letter and the website is to help Ontarians understand the proposed regulations will do little to benefit honey bees, but they will negatively impact the environment, Ontario’s farm families and rural communities, and could jeopardize our food supply. The website includes links to facts about honey bee health in Ontario, the relationship between neonicotinoids and bees, and a video of a grain farmer talking about the use of neonicotinoids and his relationship with a beekeeper. Watch for updates leading up to the 2015 March Classic on March 24 using the hashtag #GFOClassic. Use the hashtag yourself during the conference to discuss speakers and if you have the most tweets you will win a Good in Every Grain gift pack. Cashcropper allows users to compare the net profitability and fertility requirements for different crop rotations within a given field. Powered by over 30 years of data on crop yield responses to different rotations, it uses default yield values from crop insurance records and cost of production defaults as a benchmark for the user. The user can change any of these values to better reflect their operation.